The new FrostWire 4.18.6 (code named “Iced Torrent”) is out. Right click on a tab and you’ll have the option to hide or show any of the FrostWire tabs right there. Automatic .torrent sharing has been reimplemented to correctly share .torrent files you use, thus enabling more torrent metadata file content on the gnutella network as FrostWire 4.18.6 and further versions is adopted by the community. Being a BitTorrent client it was unnatural not having a .torrent file search. The more the community uses FrostWire for BitTorrent, the more search results will be available under this search type. Other important updates for this first release of 2010 include bugfixes on Theme Handling, the Console Tab dissapearing, a lot of code cleanup, 2 reported crashes fixed and a slightly smaller installer compared to the previous version. Next releases will improve BitTorrent support and antivirus integration for windows users. Download FrostWire, it’s absolutely free and open sourced. We would like to inform you that FrostWire has successfully passed antivirus and antispyware tests and were so impressed that we decided to give you our 100% CLEAN award! We use for scanning now four of the best antivirus engines available on the market. Pretty Cool, Keep those reports coming! At the end of November 2008 the FrostWire and FrostClick team set out on a mission to find talented unsigned and indie artists and labels that were willing to share their music under a Creative Commons license or for some form of free distribution agreement. We’re proud to announce that today March, 31st 2008, we’ve been able to share over 500,000 copies of free music and video. The amount of data shared so far is well over 47 Terabytes, at absolutely no cost to the content creators. Another plus of this content being shared over FrostWire is that all this content now has thousands of seeds in Gnutella as well, where it’s now available to millions of Gnutella users. If you are an artist or content creator willing to share some of your work for free so that others experiment and get to know your work you should take a look at the requirements to be promoted on FrostClick and FrostWire. (*) Georgia Wonder’s Torrent file was hosted and tracked by The Pirate Bay, therefore we don’t have the number of completed downloads. We know it was a very popular torrent the week of the promotion because it was among the top 20 seeded music torrents. This torrent also was also published to the Mininova tracker where it shows another 9,232 completed downloads as of March 31st, 2009. Whatever the case, we feel very happy for Sean Fournier and we thank him for sharing his awesome music with the world. Sean Fournier is the first artist to ever be featured on the FrostWire welcome screen by the FrostClick team. 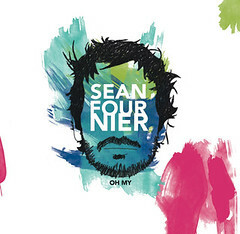 Sean Fournier is an American-born musician, more commonly known for his free album Oh My. This lyrically-driven singer/songwriter’s style stretches across many genres including folk, acoustic, and pop. FrostWire and FrostClick get some international mentions in Italy and France. Here are the links to the reviews we found.